Cleopatra Edison Oliver has a brand new business: Passion Clips. She and her best friend Caylee are going to take the world by storm with their personalized barrettes. All they need now is their big break. So when successful businesswoman Fortune A. Davies announces a new website where "kidpreneurs" can upload ads for their businesses, Cleo invites all of her customers to film an ad for FortuneTube. But making a commercial is different from running a business, and when Cleo's customers get fed up with her direction, she might lose her friends and her chance to shine. Meanwhile, Cleo is more and more certain that she wants to meet her birth parents -- but she's starting to wonder if they will ever want to meet her. Can she win back her friends, take her business to the next level, and find the family she's been looking for? 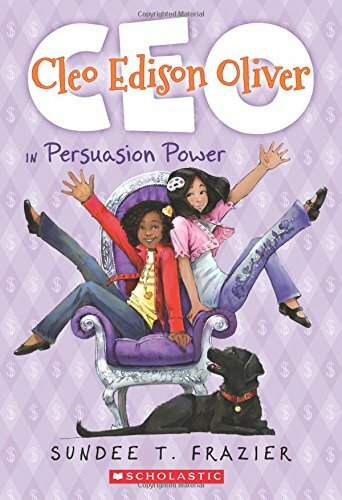 We loved reading the other Cleo novel in the past and this book continues the tradition of great writing and fun characters. My daughters and I love the character of Cleo as her energy is so infectious. Also, the humor throughout the book kept a smile on our faces from beginning to end. Best of all was the story as it really moved and compelled us to keep reading throughout and by the end we were asking for more!